Anything goes on this exclusive Aloha Plate Food Tour- from opihi to poke to spam musubi, you’re guaranteed to sample some of Hawaii’s best and most authentic foods. Lanai Tabura, winner of Food Network’s ‘The Great Food Truck Race’ will be your guide and is as local as it gets. 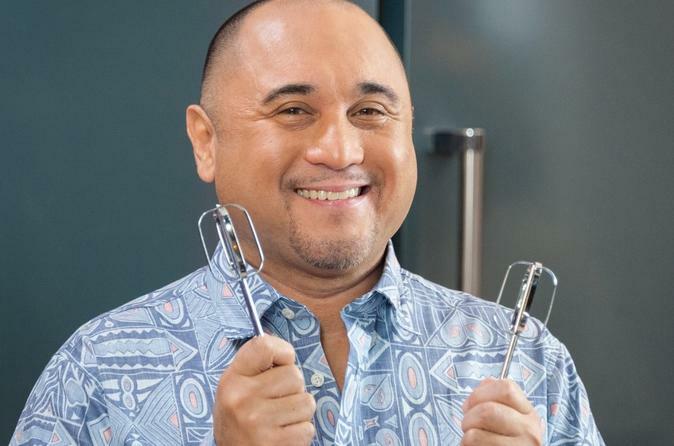 Born and raised on the pineapple island of Lanai, this entertainer is a wealth of knowledge when it comes to Hawaii’s culture, people and food. Lanai is a one-of-a-kind guy and loves showing visitors a good time on Oahu in a local style way. Explore the history and culture of the islands at Hawaii Plantation Village and learn why this state is considered the melting pot of the Pacific. You’ll also stop at a local poke shop and sample a variety of fresh Hawaiian seafood plus some of Lanai’s favorites. Keep an open mind and let your taste buds do the talking! This is your chance to try new things and keep a fresh outlook on life. You’ll never know unless you try! Lanai usually has a surprise up his sleeve for every tour, so get ready for a spontaneous, fun and exciting adventure with one of Hawaii’s most loved local boys. Foodies and nonfoodies alike, we are sure you (and your taste buds) will love this tour!